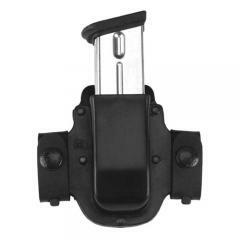 Building on the tremendous success of the M7X Matrix® holster, Galco introduces the M15X Matrix single magazine case. Like the M7X, the M15X attaches to the belt with snap-on belt loops, offering convenient, quick on-off capability, along with excellent concealability and simplicity of use. As a companion for one of Galco's Matrix holsters or any other holster, the M15X provides a high-performance yet economical way to carry a spare magazine. CQB / Rigger's Belt - 1.5"